The tragedy of the Fukushima nuclear plant disaster took place almost three years ago. Since then, radiation has forced thousands out of their homes and led to the deaths of many. It took great effort to prevent the ultimate meltdown of the plant – but are the after effects completely gone? Tokyo says yes; it also claims the government is doing everything it can for those who suffered in the disaster. However, disturbing facts sometimes rise to the surface. To shed a bit of light on the mystery of the Fukushima aftermath, Sophie Shevardnadze talks to the former mayor of one of the disaster-struck cities. Katsutaka Idogawa is on SophieCo today. Sophie Shevardnadze:Mr. Idogawa, welcome to the program. Your town of Futaba was heavily dependent on cash coming in from the nuclear reactors and you yourself approved building more reactors. Did you believe back then, that something could go wrong? Katsutaka Idogawa: Yes, I suspected it might, but I didn’t expect an accident of such proportions. SS:You’ve said before that you knew right away that the government, that TEPCO – the plant’s operator, would lie about the consequences of the accident at Fukushima. When did you lose trust in the authorities? KI: This was even before the accident, when I first came to see the management of the power plant. I asked them about potential accidents at a nuclear power plant, pretending I didn’t know anything about it, and it turned out they were unable to answer many of my questions. Frankly, that’s when it first crossed my mind that their management didn’t have a contingency plan. It was then that I realized the facility could be dangerous. SS:March 11, 2011 - the day the devastating earthquake and tsunami hit Japan...where were you that day? KI: I wasn’t in Futaba that day, but I was near. I went to a nearby town on business. That’s where I was when the earthquake hit. SS: What did you see around you? SS:When a catastrophe of this scale happens, I understand that it is very difficult to control your emotions, it is difficult to get a hold of yourself, take any action. What were your first actions? KI: The earthquake was very strong. I just kept thinking, “If it’s that strong, what will happen to the power plant? What if the reactor is damaged? What if the water leaks? What will the city do? What am I to do as mayor? SS:I can only imagine how much worry you felt at that moment. Do you remember what you did right after the disaster hit? KI: It took me 20-30 minutes to get back to my office in Futaba. There was a traffic jam, so I chose an alternative route along the coast. At that moment I wasn’t thinking about anything except the fact that I had to get back as soon as possible. I heard a tsunami warning on my car radio. Tsunami waves had never been higher than 60 cm before. I thought that even if it’s big, the wave would be about 6 meters at most. I had no idea the road I was on could be washed away by the tsunami. I got lucky. The tsunami came after I drove off that road and up the mountains. I got to my office in Futaba and started checking for damage. I walked around every floor, and on the 4th floor I looked out the window. Usually you couldn’t see the sea from there, but that time I could see it just 300-500 meters away. It was a truly terrifying sight. I had all these thoughts swirling in my head: “What should I do? How to evacuate people? Where do we run? How do we save ourselves?” Also, I realized that the power plant would be damaged, and I didn’t know what to do about it. Looking back, I think I didn’t deal with the crisis well enough. I think I didn’t ask myself enough questions. SS:As I understand, you gave orders to evacuate your city right away? KI: Yes. I didn’t sleep at all that night. I was watching TV, since it was the only source of information. I kept thinking what to do with radiation, how to inform and evacuate the people. Mobile phones didn’t work because there was no signal, so radio was the only way. On the morning of March 12, I announced an emergency evacuation. I assumed radiation would not reach the mountains and we would be safe if we left the city. I told the people to go to Kawamata, a town 50 km away. There’s just one road that goes there, and it was packed with cars. Later, I learned that not all the Futaba residents heard my announcement. I feel guilty about that. Back then, I believed that it would be safe to go to Kawamata, which was further away from the plant than the government-recommended 10-20 km. Later, I found out that Fukushima Prefecture hadn’t given me all the information in a timely fashion. And now the government isn’t taking any steps to ensure people’s safety from radiation and isn’t monitoring the implementation of evacuation procedures. SS:You decided to evacuate people from Futaba as far as possible without consulting anybody - so you completely assumed responsibility? KI: Our city always had an emergency plan in case of a fire or an accident at the plant. Every year, we had special drills in case there was a fire at the plant. I think it’s the central government and the Fukushima Prefecture authorities that bear the most responsibility for what happened. As mayor, it is my responsibility to take care of the people of Futaba. At that time, I had no time to get advice. I tried talking to the prefecture authorities but there was absolute chaos. It was impossible to get advice or hold a meeting. So I chose to act on my own, and I decided to start with evacuating the people as far from the radiation as possible. SS:Your town is moving to a new location, to the neighboring city of Iwaki. Is it safe there? Do you see this as a new start for the people? KI: I’d like to show you a table with radiation levels around Chernobyl. Radiation levels around Fukushima are four times higher than in Chernobyl, so I think it’s too early for people to come back to Fukushima Prefecture. Here you can see radiation levels in our region, Tohoku. This is ground zero, and the radiation radius is 50-100km, even 200km in fact. Fukushima Prefecture is at the very center. The city of Iwaki, where Futaba citizens moved, is also in Fukushima Prefecture. It is by no means safe, no matter what the government says. Exposing people to the current levels of radiation in Fukushima is a violation of human rights. It’s terrible. SS:Evacuation advisories are being lifted for some cities in the Fukushima area, but you’re saying that the government is allowing this, despite the danger of radiation? KI: Fukushima Prefecture has launched the Come Home campaign. In many cases, evacuees are forced to return. Here is a map of Fukushima Prefecture, with areas hit by radiation highlighted in yellow, and you can see that the color covers almost the entire map. Air contamination decreased a little, but soil contamination remains the same. And there are still about two million people living in the prefecture, who have all sorts of medical issues. The authorities claim this has nothing to do with the fallout. I demanded that the authorities substantiate their claim in writing but they ignored my request. There are some terrible things going on in Fukushima. I remember feeling so deeply for the victims of the Chernobyl tragedy that I could barely hold back the tears whenever I heard any reports on it. And now that a similar tragedy happened in Fukushima, the biggest problem is that there is no one to help us. They say it’s safe to go back. But we must not forget the lessons of Chernobyl. We must protect our children. I talked to local authorities in different places in Fukushima, but no one would listen to me. They believe what the government says, while in reality the radiation is still there. This is killing children. They die of heart conditions, asthma, leukemia, thyroiditis…Lots of kids are extremely exhausted after school; others are simply unable to attend PE classes. But the authorities still hide the truth from us, and I don’t know why. Don’t they have children of their own? It hurts so much to know they can’t protect our children. SS:I understand that many children who have been evacuated are now living in the Fukushima district again; new schools have opened for these children, and you say they are facing radiation there…Is anything being done to help the children affected by the nuclear fallout? KI: Officially, both the central government and the prefecture authorities say there is no radiation. They’re not doing anything, and they’re not going to do anything. They say Fukushima Prefecture is safe, and that’s why nobody’s working to evacuate children, move them elsewhere. We’re not even allowed to discuss this. SS:So after the tragedy, the government wanted to build nuclear waste storage facilities on the territory of Futaba. You were against that, but now, as I understand, these facilities are going to be built after all. Do you fear that that will prevent residents from ever returning to their town? KI: Media report it as the final decision has been made. But that’s not true. The problem is with the decision-making process. That’s why I keep saying no. The central government makes all the decisions by itself the way it pleases. It ignores the victims. Actually, we have a rule in our country saying that decisions can’t be made without taking people’s opinion into consideration, but the government ignores this rule and just does everything the way they see fit. After all, this matter is up to landowners. Unless they agree, nothing can happen. That’s how things work in Japan. And even though there’s been much speculation, nobody has talked to landowners yet. So media reports suggesting that the final decision has been made are premature. In reality, nothing has been decided. It is not clear at this point what will happen. All we know right now is that there will be repositories built and that land will be nationalized. Radiation is a big problem today but even this problem hasn’t been solved yet. Without consulting with us, with the people, that is, Fukushima Prefecture announced that people will be relocated from the prefecture for 30 years, but they failed to keep this promise as well. It’s all very unreasonable. All the unpopular decisions were made without us. That’s why I’ve been saying no all the time. SS: In the beginning of the program you touched upon the inability of TEPCO to manage the situation at the nuclear plant. They have been struggling to contain the situation for over three years now. Why are they failing? KI: That’s the way TEPCO works. The problem is with its structure. People working at the headquarters are in privileged conditions, but those working in the field work in very difficult conditions. That’s the way it was even before the accident. That’s how this company works. When the accident happened, TEPCO couldn’t give us or its own employees the names of the people responsible for the accident. They couldn’t do that because the company doesn’t have real professionals.Even before the accident, I would sometimes go to their office as mayor, ask them a lot of questions: “Do you train your personnel? Is everything okay? Is there any chance that your old equipment may fail?” In response, they only gave me a lot of nice words. But they didn’t take any practical steps; they hardly ever did anything. TEPCO thinks too high of itself, delegating almost everything to subcontractors. That’s why, when something happens, there’s nobody to be held accountable. In addition, the company doesn’t follow the situation on the ground. Even today, we received a report saying that they made a mistake and used the wrong pump, and as a result contaminated water ended up in a wrong place. As for the restoration of the city, I am really concerned about the future of my hometown, the future of Futaba. SS:Now, Japan’s homeless are among those recruited to take part in the major cleanup - are they a viable workforce in this case? Is this because there’s a lack of qualified workers, or because those people are considered sort of ‘disposable?' Is this even true? KI: Unfortunately, it’s true. If you use workers on a one-off basis, you don’t need to watch radiation; you don’t need to care about their health. We must respect people, care about them. When talking about the Tokyo Olympics in 2020, Prime Minister Abe likes to talk about Japanese hospitality, and he uses this Japanese word “omotenashi,” which literally means that you should treat people with an open heart. But we don’t see that in our situation. While Prime Minister Noda was preoccupied with self-promotion, authorities started caring less about people who worked at the Fukushima plant. Their equipment was getting worse; preparation was getting worse. So people had to think about their safety first. That’s why those who understood the real danger of radiation began to quit. Now we have unprofessional people working there. They don’t really understand what they’re doing. That’s the kind of people who use the wrong pump, who make mistakes like that. I’m particularly concerned about their leaders. It seems to me their crew leaders aren’t real professionals. They don’t know what they’re doing. I’m really ashamed for my country, but I have to speak the truth for the sake of keeping our planet clean in the future. SS:Does the fact that the government was covering up the real scale of the disaster for so long have anything to do with the traditional Japanese fear of losing face? KI: It’s just that they wanted to avoid responsibility. SS:No, I understand, but why keep this quiet for so long? They didn’t tell the world how bad it really was - why is that? KI: There were some sad chapters in the history of Japan. The same thing happened with Hiroshima and Nagasaki. The authorities lied to everyone. They said it was safe. They hid the truth. That’s the situation we are living in. It’s not just Fukushima. Japan has some dark history. This is a sort of a sacrifice to the past. SS:The United Nations report on the radiation fallout from Fukushima says no radiation-related deaths or acute diseases have been observed among the workers and general public exposed - so it’s not that dangerous after all? Or is there not enough information available to make proper assessments? What do you think? KI: This report is completely false. 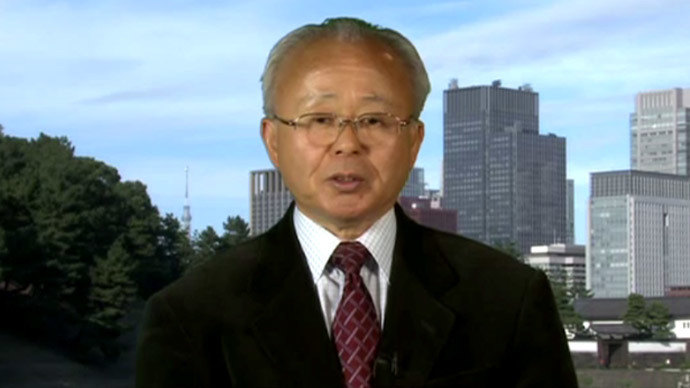 The report was made by a representative of Japan – Professor Hayano. Representing Japan, he lied to the whole world. When I was mayor, I knew many people who died from a heart attack, and then there were many people in Fukushima who died suddenly, even among young people. It’s a real shame that the authorities hide the truth from the whole world, from the UN. We need to admit that actually many people are dying. We are not allowed to say that, but TEPCO employees also are dying. But they keep mum about it. SS: Do you have an estimate of casualties? KI: Today I don’t have the numbers with me. SS:Mr. Idogawa, we only need an estimate, just to understand the scale of the tragedy you’re talking about. KI: It’s a huge responsibility to give specific numbers. It’s hard for me, because I haven’t studied this matter personally. But it’s not just one or two people. We’re talking about ten to twenty people who died this way. SS:You say that despite the Fukushima disaster, Japan is planning to build more nuclear reactors, eventually satisfying at least half of its energy needs with nuclear energy. Obviously you’re against that - but Japan really has no other choice in terms of energy, does it? KI: Yes, it has. Japan has plenty of rivers, but hydro energy is not used at all. Why? Because it’s not as profitable for big companies. Actually, we can provide electricity for a large number of people even with limited investment, without taxes. Just use gravity, and we may have so much energy that there’ll be no need for nuclear plants anymore. And we also need to change our laws. There are many laws in Japan, perhaps too many. There are laws about rivers and the ways they’re used. We could change laws regarding agricultural water use and start using rivers to produce electricity. Changing just this law alone will allow us to produce a lot of energy. We can solve the problem by using natural energy, without contaminating our planet. But this does not appeal to big companies, because you don’t need big investments, you don’t need to build big power plants. It’s not that profitable for investors, for capitalists. But people in Japan begin to realize that we need to avert nuclear disasters, so 60-70 percent of the population are in favor of using natural energy. It took us a long time, but one day we’ll follow the example of Europe, of Germany. SS:Have you personally felt the consequences of the catastrophe? Has your health been affected? KI: I now get exhausted quickly, it’s harder to speak, I often get colds. My eyesight worsened. I have a cataract. My stomach hurts. My skin is very dry. I have muscular weakness in different parts of my body. These are the consequences of the catastrophe. SS:Do you receive any treatment as a victim? KI: No, I’m not getting any treatment right now. Actually, there’s no place I could go for help. I now live in Saitama. The nearest hospital refused to treat me. So I’m trying to restore my health through nutrition.